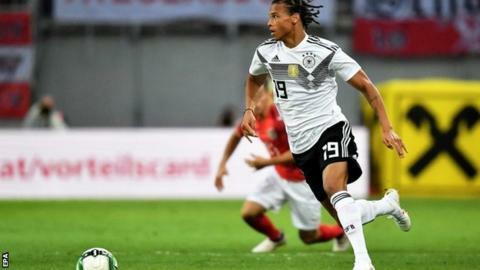 The omission of Leroy Sane came as a major surprise when Joachim Low announced his final Germany squad for the World Cup on Monday. The 22-year-old scored 14 times in 49 games for the champions and won the PFA Young Player of the Year award. Despite his fine form for City, Sané has not been able to replicate it on the worldwide stage. The England global posted a picture on Twitter of himself spitting some water out captioning it: "When you find out Leroy Sane isn't going to the World Cup", outlining how shocked he was at Joachim Low's decision to leave Sane out. He will, however, play no part for his country in Russian Federation this summer after being cut from coach Joachim Low's 27-man preliminary party. Bayern Munich goalkeeper Neuer made his first appearance since September in the 2-1 defeat by Austria in a friendly on Saturday. "Draxler Reus and Müller are set". "He had not arrived in worldwide matches yet". Also omitted are Bayer Leverkusen duo Bernd Leno and Jonathan, as well as Freiburg striker Nils Petersen. Germany are slotted in the Group F of the FIFA World Cup and will face Mexico on 17 June in their tournament opener before locking horns with Sweden and South Korea.